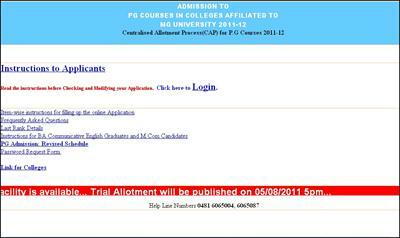 The M G University PG trial allotment list 2011 will be published on 5th august 2011 as per information provided in the university website. Students can check the official website after 7 pm, the time after the publication of the trial allotment 2011 for PG courses in colleges under the university. Mahatma Gandhi University publishes the PG trial allotment list 2011 on 5th august 2011 as per information provided in the university website. Students who are seeking admission for post graduation courses in different colleges under the university can check the university official website www.mgu.ac.in after 10 pm on 5th august 2011(latest update). The Centralised Allotment Process(CAP) for P.G Courses 2011-12 is made available to select students for post graduation courses like MA English, Ma Politics,MA Economics, M.Com and different subjects under the science stream. Candidates can check the trial allotment on 5th august after the publication of the allotment results 2011. The trial allotment will be published on http://www.lbscst.in/mg.html,as per information from the official website of the university. We have provided a screen shot of the website link. Here we provide the procedure to check the PG trial allotment 2011. 1. Enter the website. Click on the form which provides link to the trial allotment. NB:Clicking on the above photo will not give you the direct link to the website. To enter the website copy paste the link http://www.lbscst.in/mg.html on your web browser. 2. Enter your application number and password to check the allotment status. Students can check the trial allotment till 8th august. After the reschedule of the trial allotment, the university will put the first allotment list in a convenient date.